Alleged rhino poacher Ganesh Doley files nominations at Bokakhat on Thursday. Believe it or not, the Asom Gana Parishad (AGP), a key ally of the BJP led state government, has given ticket to an alleged rhino poacher to contest the ensuing panchayat elections in Assam. 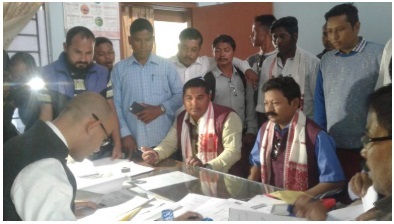 The alleged rhino poacher, Ganesh Doley, a resident of Mohmaiki Gaon in Bokakhat, filed nominations on Thursday at Bokakhat to contest for the post of president of the Moridhansiri Gaon Panchayat as an AGP candidate in Golaghat district. “Doley has a number of cases registered against him under various sections of Wildlife Protection Act, Arms Act and Indian Penal Code in Bokakhat and at Diphu police station in Karbi Anglong district. We are shocked to see how AGP has given ticket to a person with such a criminal background,” Dadu Taye, general secretary of Assam Pradesh Congress Committee (APCC) told reporters here. By fielding Doley and that too in the constituency of Atul Bora, the agriculture minister and president of AGP, it is proved that they support mafiaraj and they are not at all serious about the alarming issue of incessant rhino poaching in Kaziranga, alleged Taye. We already have filed written complaints against Doley before the state election commissioner and the sub-divisional election officer of Bokakhat and urged them to investigate into the matter and to declare Doley’s nomination as illegal, Taye said. On the other hand, when contacted to know the party’s stand on the issue, Jagat Chandra Kalita, president of AGP’s Bokakhat district committee said that there may be some allegation against Doley but unless and until he has been convicted by any court of law we can’t call him guilty. “Allegation and conviction are two different things. Even Sonia Gandhi and Rahul Gandhi are on bail in the national herald case for the alleged offences of misappropriation of property, criminal breach of trust and cheating. So Congress has no right to question us about our morality,” said Kalita. Guwahati based environmental organisation Aaranyak has also expressed concern over the participation of alleged rhino poacher Doley in the rural polls. “We are concerned that a person against whom cases related to rhino hunting and illegal arms are lodged, such accused are in election fray and have received tickets from a political party,” Aaranyak’s secretary general Bibhab Talukdar said. He said it is further indication that cases needed to be framed properly by law enforcement agencies to secure conviction so that rhinos are protected and accused are punished within the legal framework of India. Doley was arrested and jailed in 2012 in connection with a rhino poaching case in Bokakhat and again in 2014 he was arrested under Wildlife Protection Act and Arms Act.